Falvey Memorial Library :: Did you know that you can search some of your favorite research databases simultaneously? Did you know that you can search some of your favorite research databases simultaneously? Cambridge Scientific Abstracts (CSA) makes it easy to search your favorite social science databases simultaneously. Simply click on the Specific Databases link below the search boxes and select from Sociological Abstracts, Criminal Justice Abstracts, Social Services Abstracts, NCJRS Abstracts, ERIC, PsycINFO, and Communication Abstracts. Next click on Continue to Search and your selection will be listed on the search page under Now Selected: Multiple Databases. Search results will be clearly identified by database of origin. 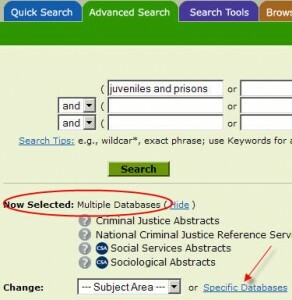 Since not all these research databases use the same subject thesaurus, it is best to avoid subject (descriptor) searches while cross searching multiple databases. Other helpful features are the export to RefWorks and the QuickBib options. Both can be found by clicking on the Save, Print, Email link from the results screen. QuickBib will format selected records into the citation style of your choice in a matter of seconds. For more bells and whistles set up a My Research account with CSA. You can find a link in the upper right hand corner of the CSA interface. My Research is your gateway to research alerts via e-mail or RSS feed, a customized search interface, and groups of preferred databases. You can also save unlimited search results and search histories to your My Research account. The price? One more login and password to remember.